The WEI Eco-Retreat Program is committed to creating a space for the health, well-being, creativity and relaxation of WEI members. 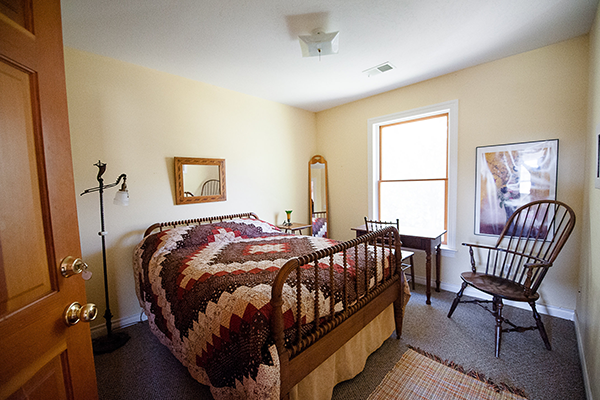 The Eco-Retreat Center has four rooms available for temporary rentals, either at individual room rates or as part of an entire facility rental. 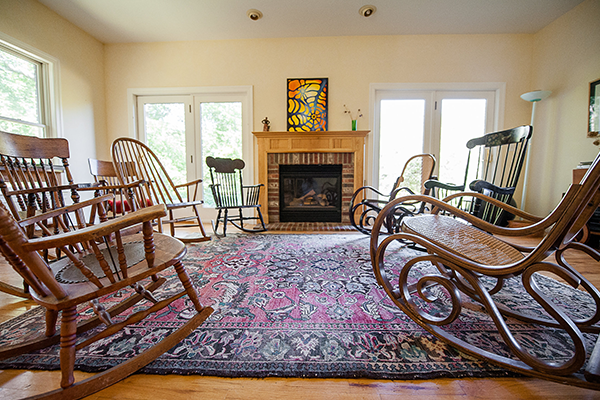 Day rentals are also available for group meetings with the group space ideally comfortable for up to 20 people. 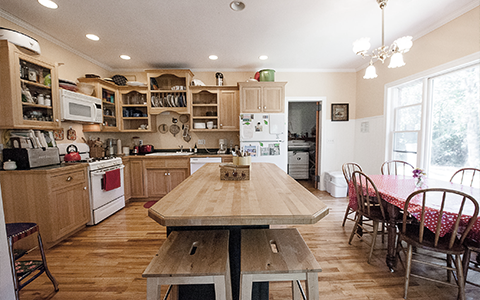 WEI can provide a modest continental breakfast with coffee for group meetings and a B&B style organically-certified breakfast for individual guests. 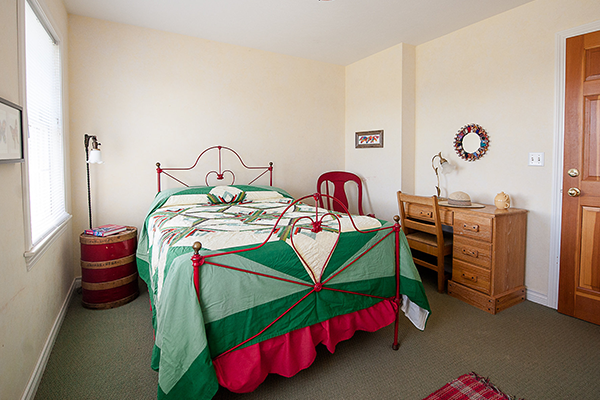 Overnight accommodations are comfortable for up to 8 people. WEI is committed to providing a quiet and serene space for activists, writers, teachers, students, scholars, artists, peace workers, families and friends. WEI expects that guests at the Eco-Retreat Center will be respectful of the mission and work of our organization. At least one person in your group must be a WEI member in order to make an individual or group reservation ($50 for single membership, $75 for double membership and $150 for Corporate/Business Memberships). WEI is located on an organically certified orchard overlooking the wooded hillside and prairie lands of Wild River State Park. 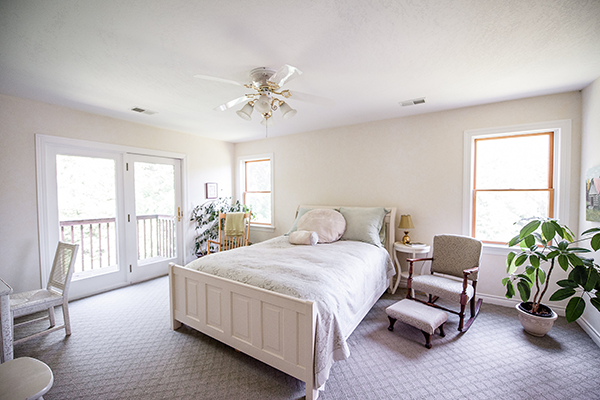 This restful place is just over an hour’s drive from the Twin Cities and located between North Branch and Taylors Falls in Amador Township (Chisago County). Call 651-583-0705 or email us for more information and to reserve. WEI Partner Organizaiton members are entitled to use the WEI Eco-Retreat Facility for one full day (8:00-4:00) for group related activities, meetings or gatherings. Additional overnight accomodations are available for members of the group at $50 per person. WEI Partner Organization membership is $150/year. Unique Features of a WEI Eco-Holiday Retreat (please note that these attractions are seasonally variable). Silence, tranquility, fresh air, and great moments in farming. Easy access to Wild River State Park for nature walks, skiing, snowshoeing or canoeing. Opportunities to learn about the WEI Organically Certified Farm and the Amador Hill Orchard. Free use of the WEI media collection including environmental education videos, nature documentaries and movies for all ages. Free use of wireless internet for your computer and access to the WEI reading library (includes children’s section). Invited and guided participation in gardening, harvesting, planting, pruning and other seasonal farm activities. Wonderful local events and community activities can always be found in the St. Croix Valley and in area towns. On the WEI campus and in the fields and orchard, smoking is prohibited. Unfortunately your family pets are not allowed. All children must be accompanied by a caring adult. WEI has a caretaker on site while guests are in residence. Campers and RVs are not permitted on the farm campus. For more information on WEI Eco-Retreat Rentals and Upcoming On-Site Classes and Workshops, call 651-583-0705. A deposit of $75 is required to secure your reservation for overnight ($250 for two weekend nights). Deposits are non-refundable.